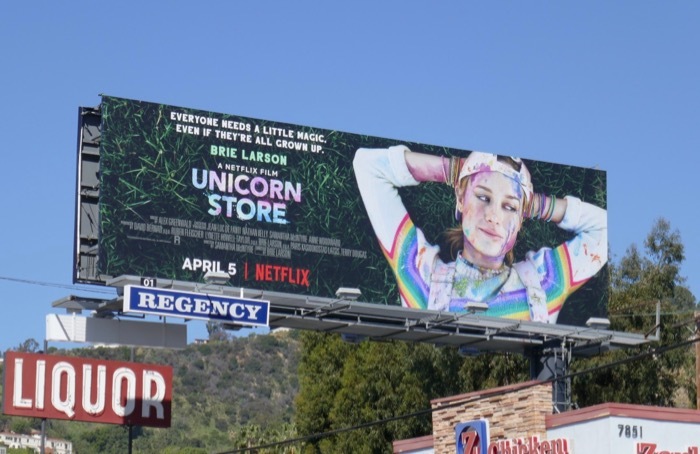 Brie Larson may have made history by taking Captain Marvel further, faster and higher past the $1 billion global box office mark and instantly becoming a recognisable idol of millions this spring, but the Oscar-wining actress was also achieving personal goals by making her feature directorial debut with the new Netflix original film, Unicorn Store. 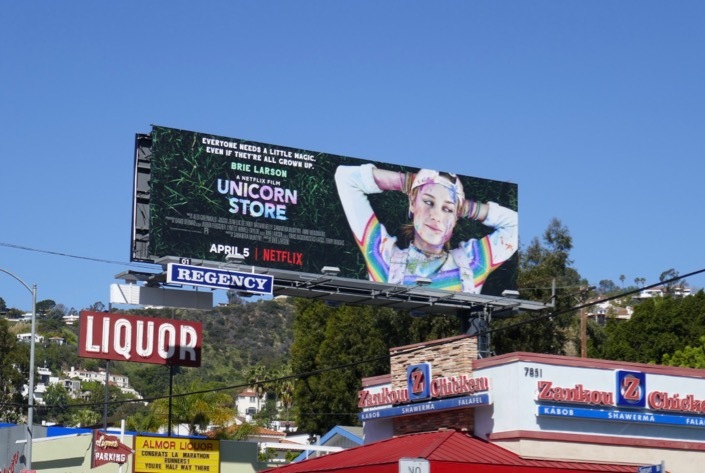 In the movie written by Samantha McIntyre she also stars as 'Kit', a failed artist forced to move back in with her parents and take a temping job to get by, until one day she gets a letter from 'The Store' and an invitation from 'The Salesman' (Samuel L. Jackson) to fulfill her childhood fantasy of owning a unicorn. 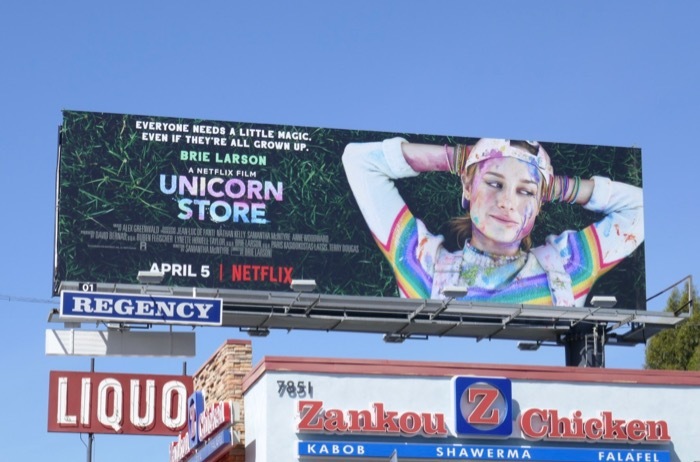 This dreamy movie billboard was snapped along Sunset Boulevard on March 29, 2019, and fans of Brie Larson can also check out these Captain Marvel movie billboards. 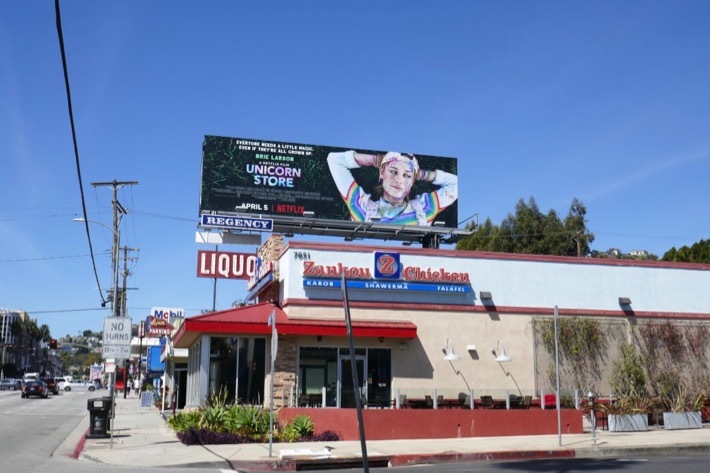 Unicorn fans can also enjoy these billboards for The League, these Happy! billboards and this China, Il billboard. We all need a little magic in our lives, no matter how old you are, so this weekend embrace your inner child and do what makes you happy.